With the easing of U.S.-Cuba relations, the U.S. government now allows visitors to Cuba to bring back $400 worth of goods, including $100 worth of rum and cigars. They are not allowed to bring back medicines that could save lives. As part of its new opening toward Cuba, the U.S. State Department has proposed a list of goods Cubans in the private sector can export to the U.S. The list does not include medicines because medicines are developed by a Cuban government research center. Every 7 minutes in the United States someone loses a limb to diabetes. A medical treatment exists in Cuba. 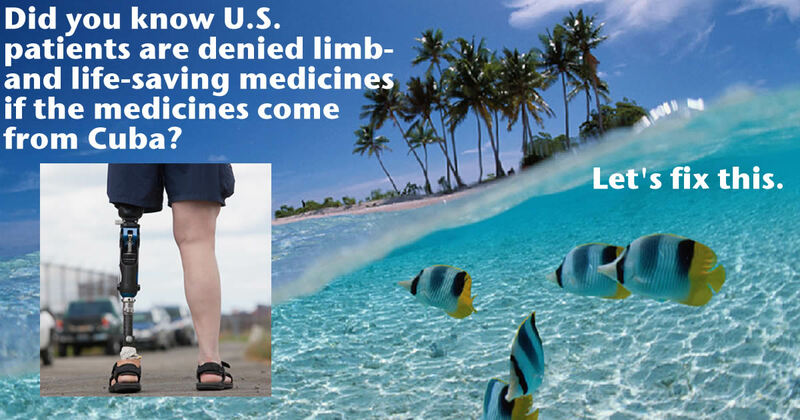 Numerous other life-improving and life-saving Cuban medicines are denied to U.S. patients. Congress members and government officials in both big political parties are beginning to oppose this policy. The regulation that needs to be changed is made by the Treasury Department. Please allow Cuban medicines to be tested in the United States and, if approved, imported into the United States. Patients should not have to lose limbs or lives over an antiquated ideological struggle. 20828 3.6 years ago Ken Gale NYC, NY People who visit Cuba's lives matter, too. 20817 3.6 years ago N.J. Moore Redwood City,, CA This stand against life-saving medical procedures and medicines from Cuba is politics at its worst! If the life of a congressperson's family were on the line, you can bet this policy would change!